New Delhi, The Congress Monday accused the BJP of creating an “artificial majority” in Goa at the directions of the Centre, and urged Governor Mridula Sinha to invite the opposition party to form a government as it was the single largest party. 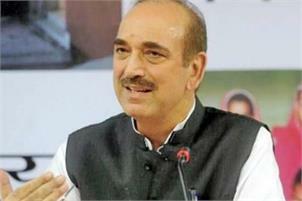 Senior Congress leader Ghulam Nabi Azad said in New Delhi, “I will like to attract the attention of whole country as well as the media that democracy should be established (in Goa). And governors, who sit on the position of a judge, should take correct decision. He also referred to the last Assembly elections in the state and mentioned that the Congress emerged as the single largest party and tried form a government. “What we tried before, we are trying again. When elections happened in Goa, the Congress emerged as the number one party. The BJP got fewer seats (than Congress). Now, the BJP’s MLA count has gone down (further). BJP’s MLA count is 11 and Congress’s is 14. We have three MLAs more as compared to them,” he told reporters. Gadkari said in Panaji the BJP had zeroed in on the next CM candidate but its allies were yet to get on board. He, however, did not reveal who the BJP had chosen.